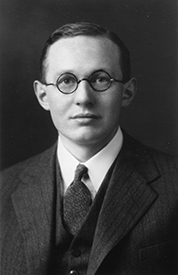 Ernest T. S. Walton was awarded the Nobel Prize in 1951 with John Cockcroft "for their pioneer work on the transmutation of atomic nuclei by artificially accelerated atomic particles." Walton was educated at Trinity College, Dublin and the University of Cambridge and held positions at those universities throughout his career. October 6, 1903Birth, Dungarvan (Waterford, Ireland). 1926Obtained BSc in Physics, Trinity College, Dublin (Ireland). 1927Research fellow, Cavendish Laboratory, University of Cambridge, Cambridge (England). 1927Obtained MSc in Physics, Trinity College, Dublin (Ireland). 1930Awarded the Senior Research Award, Department of Scientific and Industrial Research. 1931Obtained PhD in Physics, University of Cambridge, Cambridge (England). 1932 – 1934Awarded Clerk Maxwell Scholarship, Cavendish Laboratory, University of Cambridge. 1934 – 1974Fellow (1934); Erasmus Smith’s Professor of Natural and Experimental Philosophy (1946); and Senior Fellow (1960), Trinity College, Dublin (Ireland). 1938Awarded the Hughes Medal, Royal Society. 1951Awarded the Nobel Prize in Physics with John Cockcroft "for their pioneer work on the transmutation of atomic nuclei by artificially accelerated atomic particles". June 25, 1995Death, Belfast (Northern Ireland). Awarded 1951 Nobel Prize in Physics with Cockcroft "for their pioneer work on the transmutation of atomic nuclei by artificially accelerated atomic particles." Research Fellow and Clerk Maxwell Scholar. Received BSc in physics (1926) and MSc in physics (1927). Fellow; Erasmus Smith’s Professor of Natural and Experimental Philosophy; and Senior Fellow. Awarded the Senior Research Award (1930). Awarded the Hughes Medal (1938). Received PhD in Physics (1931). E. T. S. Walton papers, 1927-2005 (bulk 1927-1938). Ernest Walton papers, 1921-circa 1980s. The first penetration of nuclei by accelerated particles [sound recording] / 1969 August. Oral history interview with Alan J. Walton, 2014 May 21. Atomic Heritage Ernest Walton profile and biography. Ernest Walton Nobel Prize biography. The fly in the cathedral / Brian Cathcart.